Some answers to questions you might have. If you don't find your answers here feel free to contact us. We clean the rooms daily from 11:00am to 4:00pm during which time you will be asked to leave the room. 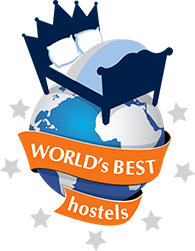 You are not obliged to leave the hostel altogether and are welcome to wait in any of the common areas during this time. Unfortunately no. It’s part of the Montmartre folklore! 🙂 If you have difficulties with stairs please inform us well before your arrival so we may make arrangements for you to stay on a lower floor. Yes! The password is available at the reception and you’ll enjoy free WIFI everywhere in the hostel. Yes. Check-in is at 4 pm. If you arrive earlier you can leave your baggage in our storage until your room is ready. Check-out is at 11AM. Sheets are provided! Towels are available at the reception. There is a small kitchen with a fridge, a microwave, hot plates and a kettle. Very useful for small budget 😉 Free coffee all day long! A Paris Hostel like no other!